Thomas Say was born in Philadelphia, Pennsylvania on June 27, 1787 the son of Benjamin Say, a physician and former state senator, and Ann Bonsal, the granddaughter of botanist John Bartram. Say's ancestors on his father's side had been in Pennsylvania since its founding. Say's mother died during the yellow fever epidemic of 1793 along with his sister Polly. In May 1799, when Say was 12 he was one of the first pupils to attend the Westtown Boarding School, a newly established Quaker school. After finishing school (at 15 as was the custom at the time) Say helped his father in his apothecary business, and was eventually joined by John Speakman, to found Speakman and Say, an apothecary. It was Speakman who ran the business because Say was often distracted by the pursuit of insect and butterfly specimens. Due to his distraction from the business the apothecary failed. A self taught naturalist, Say as a boy collected specimens for his great-uncle William Bartram. In 1812 he became a charter member and founder of the Academy of Natural Sciences of Philadelphia. Say lived in the rooms of the academy, sleeping underneath the skeleton of a horse. During the War of 1812, say briefly served as a private in the First City Troop. Say only served for slightly over three months in federal service, as the Troop was released from federal service at the end of the war, although Say remained a member. In 1817 the Academy began publication of a journal, to which Say was a member of the publication committee and a frequent contributor. 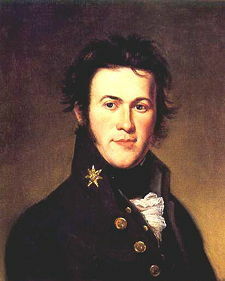 In 1818 Say joined an expedition to Georgia and Florida (a Spanish possession at the time) several other members of the Academy. The expedition was forced to return home for fear of attacks from native Americans. In 1819-20 Say served as zoologist for Major Stephen Harriman Long's expedition to the Rocky Mountains and and the tributaries to the Missouri River, and in 1823 Say again served as zoologist for Long's expedition to the headwaters of the Mississippi River. In 1825 Say moved to New Harmony, Indiana at the urging of his friend and patron of the Academy William MacLure. Say, not a member Robert Owen's communistic community in New Harmony, lived as a hermit, collecting specimens and making notes. In New Harmony Say married Lucy Way Sistare, an artist and illustrator and later the first female member of the Academy. With Sistare's help Say was able to complete three volumes on the insects of America and six on the shellfish of North America. During his career Say described over 1000 beetles and three hundred other insects. For his work he is called the "Father of American Entomology" and he has several species have been named after him. Say died on October 10, 1834 in New Harmony.